A granddaughter of Captain Scott has arrived in Antarctica exactly 100 years after he began his epic and fatal journey. Dafila Scott has been chosen by the Friends of the Scott Polar Research Institute (SPRI) in Cambridge to be their artist in residence on HMS Scott. "The opportunity to go to Antarctica on the centenary of my grandfather's last expedition is amazing," she said. Altogether she will spend a month on the Royal Navy ocean survey vessel. The ship is the second to be named after Captain Robert Falcon Scott. He and his team died on their return journey from the South Pole. They hoped to be the first explorers to reach it. Instead they were beaten to it by the Norwegian explorer Roald Amundsen a month earlier. Dafila Scott, who lives near Cambridge, specialises in painting landscapes and is a member of the Society of Wildlife Artists. "Antarctica is the last great wilderness," she said. "As an artist, I hope I can produce work which will bring the excitement and fascination of the place to a wider audience." She is the Friends of SPRI's artist in residence this year, and a special exhibition of her Antarctica work will be held at the Polar Museum at Cambridge University's Scott Polar Research Institute. While Dafila is following in her grandfather's footsteps, other descendants of Scott's expedition joined a reunion with descendants of Amundsen's party. 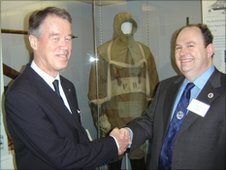 They met on 3 February 2011 at the Polar Museum, exactly 100 years after Amundsen's ship the Fram met Scott's ship the Terra Nova in the Ross Sea. "I'm very excited," said David Wilson, who is a great-nephew of Scott's chief of scientific staff, Dr Edward Wilson. 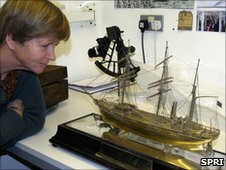 "It's not every day the descendants of the Fram expedition come to Cambridge and it's 100 years of history." Johan Leon Amundsen agreed: "It's great. It's the first time I've been to the museum." 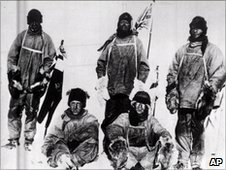 He was particularly interested in seeing the objects his great-uncle, Roald Amundsen, had left at the South Pole, which were found on Scott's party after their death. These finds "proved that Roald was right, he had been on the South Pole," explained Johan. David said: "The extraordinary thing is we have quite a lot in common, being descendants, although everyone thinks we're great rivals. "Because Amundsen's been rubbished in Norway by the newspapers and various authors, and Scott's been rubbished over here, so you have the experience of people writing rude things about your grandfather and you have to put up with it."